John R. Niernsee; Et al. The South Carolina State House is the building housing the government of the U.S. state of South Carolina, which includes the South Carolina General Assembly and the offices of the Governor and Lieutenant Governor of South Carolina. Located in the capital city of Columbia near the corner of Gervais and Assembly Streets, the building also housed the Supreme Court until 1971. The State House is in the Greek Revival style; it is approximately 180 feet (55 m) tall, 300 feet (91 m) long, 100 feet (30 m) wide. It weighs more than 70,000 short tons (64,000 t) and has 130,673 square feet (12,140 m2) of space. The old State House was constructed between 1786 and 1790. James Hoban, a young Irishman who emigrated to Charleston shortly after the Revolution, was the architect. Upon the recommendation of Henry Laurens, President Washington engaged him to design the executive mansion in Washington. Old pictures of the two buildings show architectural similarities. The Old State House was destroyed during the burning of Columbia in 1865. The South Carolina State House was designed first by architect P. H. Hammarskold. Construction began in 1851, but the original architect was dismissed for fraud and dereliction of duty. Soon thereafter, the structure was largely dismantled because of defective materials and workmanship. John Niernsee redesigned the structure and work began on it in 1855, slowed during the Civil War, and was suspended in 1865 as General W.T. Sherman's U.S. Army entered Columbia on February 17. Several public buildings were "put to the torch" when United States troops entered the city. The new capitol building, under construction, was damaged by artillery shells. The old capitol building was set afire by U.S. Army troops under Sherman's command. The reconstruction era poverty slowed progress. The building's main structure was finally completed in 1875. From 1888 to 1891, Niernsee's son, Frank McHenry Niernsee, served as architect and much of the interior work was completed. In 1900 Frank Pierce Milburn began as architect, but was replaced in 1905 by Charles Coker Wilson who finally finished the exterior in 1907. Additional renovations were made in 1959 and 1998. The State House was designated a National Historic Landmark in 1976 for its significance in the post-Civil War Reconstruction Era. South Carolina State House from the 15th floor of the Main and Gervais Tower. The building's grounds are home to several monuments. On the north side, leading to the main entry, is the Confederate Monument which included a flagpole flying a traditional version of the Confederate battle flag until it was removed on July 10, 2015 by State Bill. The monument was established after a controversy during the state's 2000 presidential primary about the Confederate flag flying over the dome of the State House. The flag was originally placed over the dome in 1962 by a concurrent resolution of the state legislature during the commemoration of the Civil War centennial. The resolution failed to designate a time for its removal. The flag was moved near the monument on July 1, 2000, after passage of the South Carolina Heritage Act of 2000. It was then removed from the grounds on July 10, 2015 by order of Republican governor Nikki Haley, and given to the South Carolina Confederate Relic Room & Military Museum. On the east side is the African-American History Monument, authorized by Act 457 of the General Assembly and unveiled on March 26, 2001. President George Washington: bronze replica cast in 1857, purchased by South Carolina in 1857; replica of Jean-Antoine Houdon's Washington statute at the Virginia State Capitol). Revolutionary War Generals (dedicated 1913): monument sculpted by Frederic W. Ruckstull and commissioned by the South Carolina chapter of the Daughters of the American Revolution; honors Andrew Pickens, Thomas Sumter and Francis Marion. Palmetto Regiment - the Legislature appropriate funds for this monument, created by Christopher Werner, in 1856; it is a cast iron and copper palmetto. Wade Hampton III - this 16-foot bronze equestrian statue of Hampton, a Confederate general and later South Carolina governor and U.S. Senator, was unveiled in November 1906. It was modeled by Frederick Ruckstull. South Carolina Soldiers Monument - A Confederate memorial was erected in 1879, and was unveiled before a crowd of 15,000. The monument was largely destroyed by lightning in 1882, but was replaced by the state two years later. Monument to South Carolina Women of the Confederacy - a bronze Confederate monument, by Frederic W. Ruckstull, erected in 1912. James F. Byrnes - a monument to this longtime South Carolina politician was erected in 1972 after a private fundraising effort. Strom Thurmond - in the late 1990s, the state erected this statute in honor of the former South Carolina governor, U.S. senator, and Dixiecrat candidate for president. The original inscription of the names of Thurmond's children were later altered to include the name of Essie Mae Washington-Williams, the daughter of Thurmond and an African American maid. Benjamin Tillman (dedicated 1940) - U.S. Senator; this monument is controversial due to Tillman's virulent racism, support for Jim Crow, and advocacy of terrorizing blacks who attempted to vote during Reconstruction. Dr. J. Marion Sims - This monument to Sims, a South Carolina physician and pioneer in gynecology, is located on State House grounds near the intersection of Assembly and Gervais streets. This monument is controversial because Sims engaged in surgical experimentation on enslaved women without anesthesia. Law Enforcement Memorial - erected in 2005, this memorial honors South Carolina law enforcement officers killed while on duty. Captain Swanson Lunsford (d. 1799), a Virginia-born American Revolutionary War officer who once owned land that is now part of the State House, is buried on State House grounds, along with a marker erected by his descendants in 1953. Christopher Werner, maker of the "Iron Palmetto"
^ a b "South Carolina State House". National Historic Landmark summary listing. National Park Service. Archived from the original on April 23, 2008. Retrieved March 24, 2008. ^ "Supreme Court History". South Carolina Judicial Department. Retrieved June 16, 2011. ^ Lynn Sims Salsi (2003). Columbia – History of a Southern Capital. Charleston: Arcadia Publishing. p. 50. ISBN 0-7385-2411-5. ^ "SC Statehouse". South Carolina State Parks. Archived from the original on July 12, 2011. Retrieved June 16, 2011. ^ "The State House History". South Carolina State House Student Connection. Archived from the original on April 23, 2011. Retrieved June 16, 2011. ^ "The State House History". South Carolina State House Student Connection. Archived from the original on April 23, 2011. Retrieved July 23, 2012. ^ Bryan, John Morrill: Creating the South Carolina State House, page 116. University of South Carolina Press, 1999 ISBN 1-57003-291-2. ^ "South Carolina Statehouse, Richland County (Main & Gervais Sts., Columbia)". National Register Properties in South Carolina listing. South Carolina Department of Archives and History. Retrieved March 24, 2008. ^ "South Carolina Confederate Monument". The Historical Marker Database. Retrieved 24 June 2015. ^ Jake Tapper (April 18, 2000). "John McCain to condemn Confederate flag". Salon.com. Archived from the original on February 3, 2009. Retrieved June 16, 2011. ^ "Journal of the House of Representatives of the Second Session of the 94th General Assembly of the State of South Carolina." Confederate Flag Vertical File, South Carolina Political Collections, University of South Carolina. ^ "South Carolina Confederate Flag Removal Bill - Video - C-SPAN.org". C-SPAN.org. ^ "South Carolina Gov. Nikki Haley Signs Confederate Flag Bill Into Law". NPR.org. 9 July 2015. ^ George Washington Monument, South Carolina State House. ^ Revolutionary War Generals Monument, South Carolina State House. ^ Wade Hampton Monument, Columbia, Digital Public Library of America. ^ a b Thomas J. Brown, "The Confederate Retreat to Mars and Venus" in Battle Scars: Gender and Sexuality in the American Civil War (eds. Catherine Clinton & Nina Silber: Oxford University Press, 2006), p. 189-91. ^ a b K. Michael Prince, Rally 'round the Flag, Boys! : South Carolina and the Confederate Flag (University of South Carolina Press, 2004), pp. 23-24. ^ Justin Curry Davis, Funding South Carolina's Monuments: The Growth of the Corporate Person in Monument Financing (University of South Carolina M.A. thesis, 2017), pp. 11-15. ^ Dell Upton, What Can and Can't be Said: Race, Uplift, and Monument Building in the Contemporary South (Yale University Press, 2015), pp. 200-01. ^ Sarah Larimer, Why a vitriolic Jim Crow advocate is still memorialized on S.C. statehouse grounds, Washington Post (July 19, 2015). ^ Feit, Noah (April 17, 2018). "Statue of gynecologist who experimented on slaves removed from NYC, but remains in Columbia". The State. ^ Brown, Deneen L. (August 30, 2017). "A surgeon from SC experimented on slave women without anesthesia. Now his statues are under attack". The State. Retrieved April 18, 2018. ^ Renee Sexton, SC honors fallen police officers with memorial service Friday, South Carolina Radio Network (November 10, 2017). ^ Revolutionary War Soldier Gravesite, South Carolina State House. 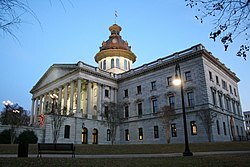 Wikimedia Commons has media related to South Carolina State House. "Confederate Flag Bill Debate". C-SPAN. April 12, 2000. Retrieved June 19, 2015. (South Carolina) State Senators debated whether to remove the Confederate flag from the Capitol building. They voted ultimately to move it from the Capitol dome to the Capitol grounds. "South Carolina State Senate Debate on the Confederate Flag". C-SPAN. 23 June 2015. Retrieved 25 June 2015. The South Carolina State Senate convened for a special session to debate a procedural measure that would allow them to consider at a future date a bill that would remove the Confederate flag from the State House grounds. The resolution was passed by voice vote. The South Carolina House of Representatives had passed a similar motion, as called for by Governor Nikki Haley (R-SC). State senators also paid tribute to State Senator Clementa Pinckney, who was one of the nine people killed in the June 17, 2015, shooting at the Emanuel African Methodist Episcopal Church in Charleston. This page was last edited on 28 March 2019, at 13:23 (UTC).